At slower speeds (6.5 - 7.4 mph), the oxygen costs of running on a treadmill match those of running outdoors. But, at speeds of 8.4 mph and above, treadmill running requires about 6% less effort than running outdoors. 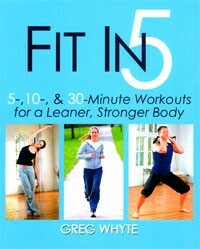 Fit In 5 is an outstanding exercise resource for the average consumer or weekend warrior. • Recommended for: All consumers and weekend warriors, at any fitness level. Greg Whyte, PhD is a former Olympic pentathlete. He earned his BS in sport science, his MS in human performance, and his PhD in cardiovascular physiology. Currently, Dr. Whyte is a professor of sport and exercise science at Liverpool John Moores University. He is an Ironman triathlete and has competed in other ultraendurance events such as the Race Across America and swimming the English Channel. Chapter 1: Why Should I Bother Exercising? Chapter 2: Can't I Just Diet and Save Myself the Energy? Chapter 3: How Do I Structure My Workouts? Chapter 4: How Can I Motivate Myself to Exercise? Chapters 1 and 2 justify the benefits of regular exercise: Chapter 1 discusses the health benefits and Chapter 2 discusses the advantages of exercise over dieting for achieving weight-loss. 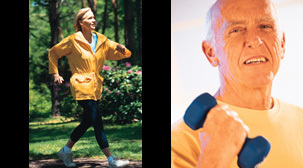 Chapter 3 reviews some of the principles for designing a sound exercise plan. Motivation and goal-setting are discussed in Chapter 4. Chapter 5 is the main focus of this book. It contains 115 pages of excellent, full-size, color photographs of adults performing simple exercises that require nothing other than exercise bands, a sturdy chair, and a pillow. The author claims that each strength exercise can be performed in 90 seconds and each flexibility exercise can be performed in 30 seconds. Each exercise is presented at 3 different levels of difficulty. Chapter 6, oddly, is only 4 pages (3 if you subtract the full-page picture at the beginning!) Chapter 7 offers a nice discussion of how to use heart rate as a guide to exercise intensity. Chapter 8 contains tables of various weekly exercise routines. • Photos & Illustrations: Outstanding. This is a major strength of this book. This book is loaded with large, full-color photos. • Tables & Graphs: Could be better. The tables in chapter 8 utilize a small, sans-serif font on a dark background, making them hard to read. Some readers might want to photocopy them. If the photocopy is black-and-white, then, they would be even harder to read. • Documentation / Accuracy: This is not a scientific-heavy book. There aren't any references cited, but, that's OK. Some of the factual statements in the introductory chapters could benefit from identifying the source, but, the absence of that is not a flaw. • What I Liked: Super-easy to use, visually appealing, excellent photos, practical, simple, not loaded with scientific principles or terminology. • What Could Be Better: Some exercises that I don't like are presented: straight-leg lifts, the plank, and the bent-over flye. These exercises are more likely to cause low-back strain, so, most deconditioned people should avoid them. Also, the use of a small, sans-serif font makes the text somewhat difficult to read. Despite suggesting some exercises that might be problematic for some subjects, I think Fit In 5 is an excellent resource. I give it 4 stars (on a 4-point scale). It is concise, simple, and loaded with excellent photos. If you are looking for a resource that suggests some simple and quick exercises that don't require a lot of exercise equipment, and, retails for less than $20, then, this is your book!